NILES, Ill. - Aug. 28, 2018 - PRLog -- Recently, Jeron Electronic Systems, Inc. partnered with a prominent Saudi Systems Integrator to sell and service Jeron's Provider® Nurse Call Systems. Jeron has been providing Nurse Call solutions to the Kingdom of Saudi Arabia (KSA) for over 15 years and this new partnership continues Jeron's expansion within the region. 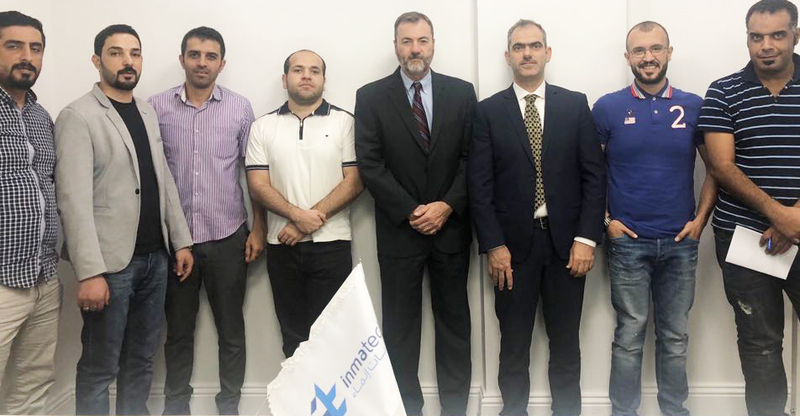 Jeron Electronic Systems, Inc. and new Saudi Distributor Inmatech (a division of Al-Turki) met this August to introduce Jeron's Provider Nurse Call Systems to their key consultants, private hospitals, and several Ministry of Health (MOH) projects in Riyadh. "We are thrilled to partner with Inmatech," Joe Beckman, Director of International Sales, comments. "Jeron's flagship platform, Provider 790 Nurse Call, is ideal for the growing healthcare market in the KSA. My task is to assist them in building a strategy to get in front of International Healthcare Architects and Engineering firms as well as the MOH Departments." Jeron was established more than 53 years ago as an internal communications systems manufacturer and joined the healthcare market in the mid-1970s with their first nurse call system. Since then, Jeron's entire line of nurse call systems has evolved to meet the needs of today's complex healthcare environments. Jeron's Provider Nurse Call System leverages the latest networking technology with mobile alerting and communications to streamline patient to staff communications across the entire healthcare facility. Jeron began selling nurse call systems internationally over 30 years ago and now has Nurse Call solutions installed in over 20 countries. As the Saudi healthcare system expands and looks for the latest technology in UL 1069 hospital systems, Jeron is ready to meet those communication and workflow needs for many years to come. For any questions or inquiries, please contact Joe Beckman at jbeckman@jeron.com.